【REAL-TIME ACTIVITY ALERTS】: By supporting motion detection, this WiFi camera will capture all movement in your room on tape. You will receive notification on your phone to update you on the potential security breach, and the wireless security camera will take snapshot automatically once motion sensor is triggered. Like this, you\'ll always be up to date on the latest security status of your property, even when you\'re not personally around. 【REAL-TIME COMMUNICATION by 2-WAY AUDIO】: A built-in microphone and speaker allowing you to check on your baby anytime from you phone. Now you can comfort your baby with the sound of your own voice by using this baby monitor with camera and audio. 【WIDE FIELD of VIEW】: By supporting Pan/Tilt and 120° wide-angle advanced glass lens, this home surveillance camera can be remotely rotated 350° horizontally and 100° vertically on APP, you can be guaranteed that this IP camera does not leave any blind spots. 【PRIVACY IS PROTECTED】Both User information and video streams have professional-grade encryption protocols to ensure utmost security. All live videos are transferred using P2P (peer to peer) and the historical videos are stored in micro SD card so they are only private for you. 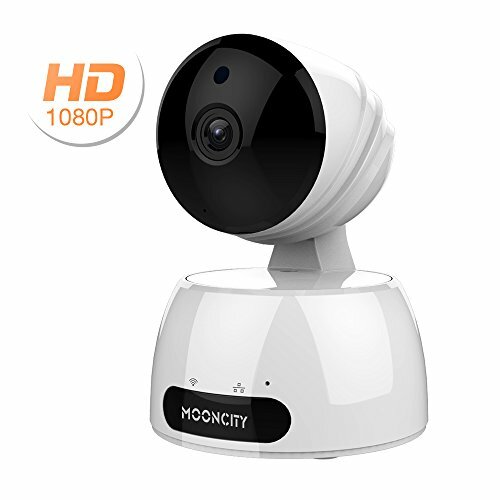 Mooncity 1080p Wireless Security Camera comes with a 12 months warranty and 90 days money back guarantee. Please contact our customer service by email customercare@santophome.com should you need any assistance.